Regular visitors to my site (Hi Mum!) will have noticed I’ve made a few changes around here. The major one being that I switched my WordPress Theme. The old Grey backdrop with white text was getting somewhat tired, and it’s not conducive to reading. So I searched for something clean and black-on-white and found Accesspress Lite, which I really like. The banner is nice but not yet clickable, and there’s some back-end weirdness to overcome to get it to work. In general though I like the change and it feels a little more modern and easy on the peepers. Please do let me know what you think of the new design in the comments below. 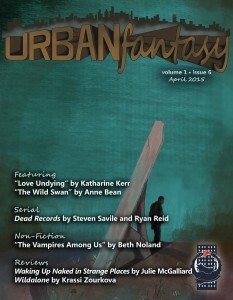 If you have a moment, please take a look at Urban Fantasy Magazine. My co-editor on Fantasy For Good, Jordan Ellinger, launched this new monthly title last year and it’s quickly gaining a foothold in the speculative pro-zine space. He brought me on as an editor, initially as slushmaster but now I’ve moved over to the pro side of the house, bugging busy authorly types for stories and then crying when they say no. Katharine Kerr didn’t turn me down though, and her brilliant story Love Undying, featuring her Nola O’Grady character, appears in issue #5 of the zine. Take a look and please consider subscribing if you like what you see. If you’re a writer, you should definitely take a look at our guidelines for submission. Every story selected is paid professional rates and all rejections include valuable feedback, which is highly unusual for a prozine. I should have an update for you shortly on Fantasy For Good, specifically about how much cash we’ve raised so far for the Colon Cancer Alliance. 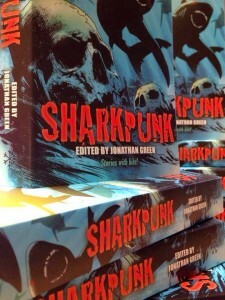 And don’t forget that Sharkpunk is released on May 1st, so not long now! Right now you can read an interview with the awesome Colliderist, Fantasy-For-Good-man and Sharkpunky Steven Savile on the Sharkpunk blog. The printed version is ready to go (can’t wait to get my copy!) and looks gorgeous judging by this shot taken by the lovely folks at Snowbooks. As for what I’m working on now, I am consumed almost entirely by a new novel project, which I can’t talk about yet because it’s for a series and so I don’t control my own destiny on this one. It’s like nothing I’ve written before, and depending on how well it’s received it may be like nothing I ever write again. It’s enormously challenging but great fun, and could be my highest profile work yet. I’ll reveal more as soon as I’m allowed to! That’s all for now. Thanks for reading and why not subscribe to this blog? The box for your email address is below.